port GmbH was founded in May 1990 as an independent company in Halle/Saale, Germany. Since then port can refer to a prosperous business development. 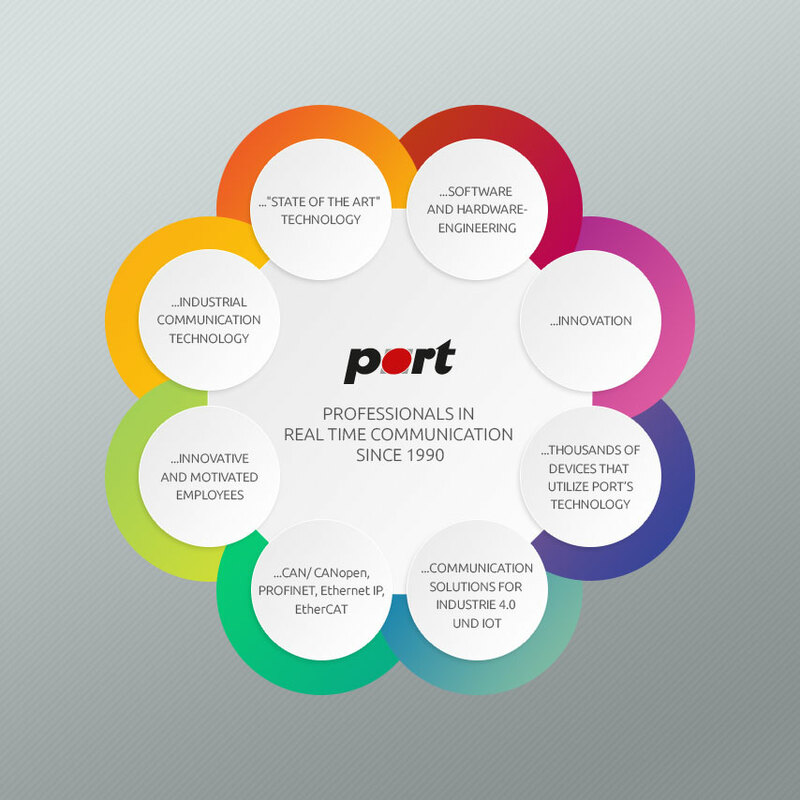 The aim of port is the development of progressive, high-quality products and engineering services in the area of industrial communications especially for CAN, CANopen, PROFINET, Ethernet/IP, EtherCAT and Ethernet POWERLINK respectively. Besides our high-performance standard products, we develop customized, client-specific fieldbus-oriented solutions, which best meet clients demands. Our services range from consulting (for fieldbus solutions) and on-site implementation of customer-specific embedded systems to the handling of a wide range of customer projects. Our ambition is not only to offer our products but to deliver the right support for handling, application engineering and implementation of CAN/CANopen, PROFINET, Ethernet/IP, EtherCAT and Ethernet POWERLINK projects. To achieve our ambition we offer engineering services, trainings and assistance for the initial operation. To meet these expectations and to provide our products, the support and our engineering services all over the world, we have existing partnership agreements or distribution contracts with companies in Germany, Europe and the USA. We see ourselves as an independent system integrator and use, wherever possible, open standards. We incorporate our long-gained experience within the business sector into the development of our products for the benefit of our customers. By meeting and exceeding the high technical quality standards of our world-wide clients our software products have reached an advanced level of functionality. To meet the high quality requirements on our products and services and to guarantee this quality for our clients port works with a process management system. port is certified since 1999 to ISO 9001:2008. At port we are constantly aware of the fact that the future of our business can only be formed in cooperation with our customers. Therefore we want to be of maximum use to our customers by offering high quality products and competent advice. We want to gain our customers trust by offering attractive products, excellent quality, innovative ideas, and develop a strong, healthy relationship with our customers. Our aim is to create the conditions necessary to meet all customers needs and to win their trust, thus ensuring a continued, and above all, successful, co-operation which will last for many years to come.